Gerry Dee | TV, eh? “I think there’s a difference between being an idiot on purpose and not trying to be. I think that’s why he gets away with it and why it works. He speaks his mind, he doesn’t hide anything. Most people don’t do that. He has no filter. But it doesn’t come from a bad place. He’s just a bit of a buffoon and that’s why people accept it.” Continue reading. Based on Dee’s real-life experiences as a high school teacher before he switched to stand-up comedy full-time, Season 1 debuted in January 2012 to 1.3 million viewers, the highest-rated scripted show premiere on the network in seven years. Gerry has been through a lot in the past six seasons at Xavier, embarrassing himself in front of Roberto Alomar and Donovan Bailey and accidentally marrying Lisa Mason (Lauren Hammersley). The Season 6 finale, “Gerry Charters a New Course,” found Gerry upset about his contract not being renewed at Xavier and considering starting his own school with help from Malik (Suresh John). Meanwhile, Lisa was without a job after quitting following a miscommunication. Mr. D also stars Bette MacDonald, Jonathan Torrens, Emma Hunter, Bill Wood, Darrin Rose, Kathleen Phillips, Mark Little, Naomi Snieckus and Wes Williams. When we left Gerry Duncan (Gerry Dee) and Lisa Mason (Lauren Hammersley) on Mr. D at the end of Season 5, the pair had woken up from a drunken night on the town, next to each other in bed and—gulp!—married. Season 6, returning with “Gerry Does It Again” on Tuesday at 9:30 p.m. on CBC, jumps back into bed with the pair, who are adjusting to life as a married couple. Those nuptials extend past Episode 1, presenting an interesting challenge not only for the characters but co-creator Gerry Dee and the writing team. We spoke to Dee ahead of Tuesday’s return, about where the show is headed, its guest stars, its Orphan Black moment, and an update on the Mr. D adaptation Will Arnett had planned for CBS. I think it was a bold move to have Gerry and Lisa get married at the end of Season 5. Was that idea floated around before Season 5, or did it come to fruition while writing this past season? One season, we changed it up and had Lisa become principal and that was a big thing. This time, we had Lisa and Gerry get married. You might wonder why Lisa is single? She’s very attractive and has a great career. We didn’t want Lauren to play the typical sitcom girl. We wanted to throw her a curve ball. She doesn’t have a boyfriend or a ton of friends. Gerry is definitely in the same boat, and it was kind of out of nowhere the way we thought of it. We have such great writers, headed by Jessie Gabe, and you just start throwing ideas around. We tried to have Gerry in a relationship in Season 2 and it just didn’t feel right. We tried to just stay away from Gerry in a relationship and this idea came to us. We have a lot of fun with it in Season 6. Their relationship continues for at least one more episode. Why did you choose to keep it going? Will it show Gerry’s evolution as a man? Look, they’re both not getting any younger. We’ve always established that Gerry wants to have a wife and kids. He’s not a player and is trying to find true love. Maybe this is a great place for me. I don’t think Gerry has ever deviated from wanting to be married. Is this settling? Maybe, in his mind. Or maybe it’s more Lisa settling. Or maybe it’s a cute way of flirting. Meanwhile, Nisha and Simon are continuing their relationship. You’ve thrown Steven into the mix as Simon’s nemesis … who is also played by Mark Little. Clearly, Mark was up to the task of playing two characters. We’ve played this story all along that Simon has this weird dynamic with his mother. There is this hint of incestuousness between them. The suggestion came, ‘What if we had a guy that looked like Simon?’ And then we went one step further. We pulled an Orphan Black. Those two are so funny. Adding Emma Hunter to the cast was great. We have such a strong cast and coming in and fitting in that group isn’t an easy task. She’s done it. And we have such a wonderful writers’ room and that’s a huge, important part of any show. People give me credit because my name is on the show but this cast and writing room makes the show. And the producers and the crew. We have camera operators who will throw a line in. Everyone weighs in. 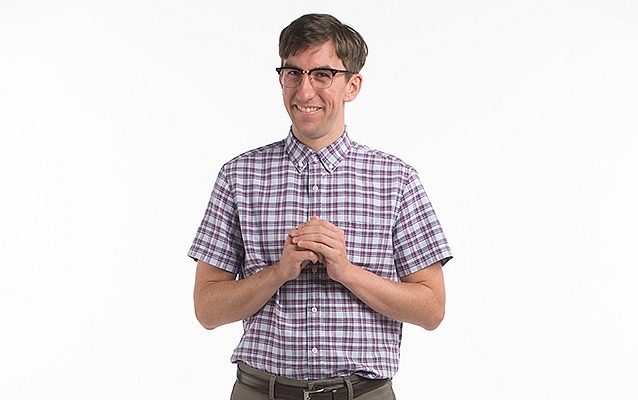 Who did you have in the writers’ room with you in Season 6 in addition to Jessie Gabe? We had a little bit of Anita Kapila in Season 6, though she was working on Kim’s Convenience, which I think is a very funny show and will do well. We had Shebli Zarghami, Dane Clark and Linsey Stewart, George Reinblatt and co-creator Mike Volpe and myself. It’s such a great group now; the cohesiveness of the writers’ room is so important. What can you reveal regarding guest stars this season? I know Missy Peregrym from Rookie Blue stopped by. Mike Dopud appears. He’s been in so many things and we co-starred together in Canada Russia ’72. Something that Mike and I have done over the years—I’ve done it in the past with comedians I know by bringing them into the writers’ room or on the show—using people you’ve worked with. Missy and I had always connected at award shows and told her I’d love to get her on the show and I knew Mike from Canada Russia. But we rely less on guest stars now because our cast is so big. What’s the status of Will Arnett’s adaptation of Mr. D for CBS? That kind of came and went pretty quick. I wasn’t involved and Mike wasn’t involved. They liked the idea and liked the show. They hired a showrunner and he wrote a script and, I guess, he submitted it and it was turned down and the show was passed on. Mike and I are still looking. We think the show would do well in any country and we don’t know why someone hasn’t picked up the episodes and put them on a network somewhere. I’m meeting with folks and eOne is shopping it around, but from what I understand comedy is a hard sell internationally and the U.S. has hundreds of shows. Mr. D airs Tuesdays at 9:30 p.m. on CBC. 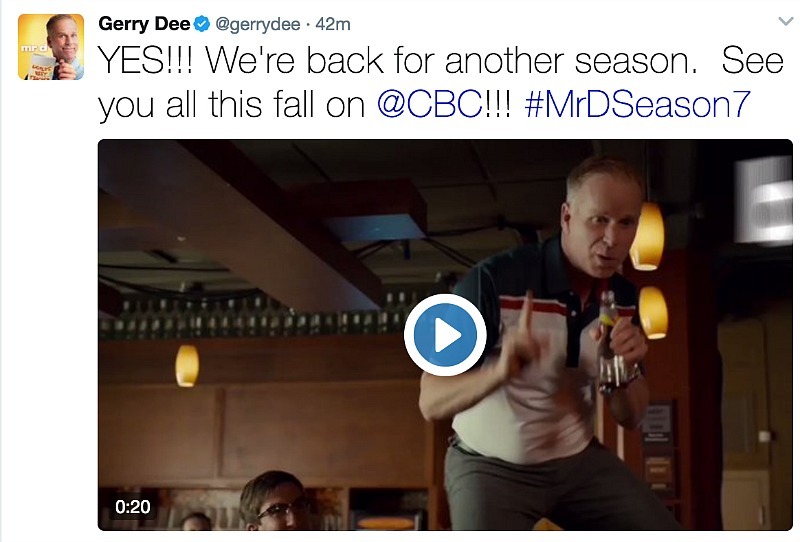 Principal photography on Season 6 (10 x 30) of Mr. D – the popular CBC series starring comedian Gerry Dee – is now under way in Halifax. The new season will premiere this fall. Exploring the staff and student dynamics at a private school, Mr. D is based on the stand-up comedy act of Dee, who was a teacher for nine years before transitioning to a career in comedy. The series revolves around the eponymous Mr. D, an under-qualified and unmotivated teacher trying to fake his way through work – and life. The current season picks up from the hilarious Season 5 finale, in which Gerry and principal Lisa Mason (Lauren Hammersley) got hitched in a drunken haze following a disastrous fun fair at the elite day school. Season 6 storylines include Gerry teaching in a prison to earn extra cash; Robert (Jonathan Torrens) fulfilling a few of his lifelong dreams; and Simon (Mark Little) and Nisha (new principle cast member Emma Hunter) slowly exploring their complicated relationship. Mr. D also stars Bette MacDonald (Trudy), Naomi Snieckus (Bobbi), Darrin Rose (Bill), Wes Williams (Paul), Suresh John (Malik), Kathleen Phillips (Emma), and Bill Wood (Frank). Guest stars this season will once again include Youtube sensation Madison Tevlin, reprising her role as feisty Ricki, and other surprise guests to be announced later. As well, Sandra Rogers, the winner of CBC’s Mr. D Favourite Teacher Contest, will be heading to Halifax for a walk-on role later this summer. A teacher-librarian at Garth Webb Secondary School in Oakville, ON, Rogers was nominated by one of her students, 15-year-old Ishmam Tanveer. Mr. D is produced by Topsail Productions Limited and Gerard ADHD Entertainment Inc., in association with CBC, and is distributed worldwide by Entertainment One Television International Ltd. The series shoots in studio and on location in and around Halifax until mid-August.